You may specify a number of files and folders that SecretBurner will wipe through its secret burning task. This feature may be useful if you want to wipe temporary or scratch folders for some programs. 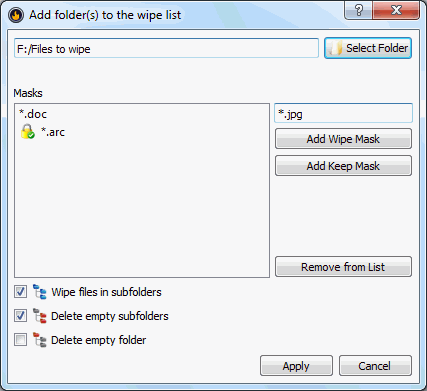 You may include into a wiping list separate files and folders, or subfolders and files that match specified file masks. Remember: Once wiped, a folder or file cannot be recovered. All its data will be wiped out for good! 3 Specify the mask and other options on the dialog box and click the Apply the Mask button.